Social media has proven to be a fantastic inbound marketing tool for schools. Not only is generating organic interaction free, but it’s also a great place to foster an online community and establish a strong brand presence, ultimately working towards your goal of driving enrolments. However, with multiple social media platforms and post types to juggle, things can quickly get a little overwhelming -- especially if you’re running your school’s accounts totally solo. That’s where a nifty social media calendar could come in handy. A social media calendar is a tracking document you and your staff can use to keep an account of everything you post to your various platforms. You’ll start by logging your ideas as they come to you, and then modify each entry once you’ve fleshed out the post and eventually published it. The first thing that makes a social media calendar great is visibility. Being able to see everything you have on the horizon is beneficial not just for those who work in teams, but school marketers expected to manage an entire social media strategy themselves. Another benefit is the ability to plan ahead. Many marketers simply post things whenever they feel like it, which is completely fine, but kills any semblance of consistency. Being able to see days, weeks and even months ahead lets you be proactive, slotting in content for special events, national holidays and more. Finally, they encourage efficiency. With everything laid out and ready to be scheduled, you have the ability to go in and bulk-post once per week, which can cut out potential time wasting. Even if you do decide to post one-by-one, having a clear view of what you need to do and when it needs to be done is priceless. There are a few different ways to create a social media calendar, and it all comes down to what works best for you. For instance, here at Digistorm we love the tried-and-tested Google Sheets document, but other businesses may use an actual calendar or even a third-party software designed specifically for this purpose. We’ll take you through the elements every social media calendar needs and which programs you could use to create one. Differentiation between platforms. First and foremost, you should separate your calendar into the various social media networks your school uses. You could do this by creating different tabs within a document, or by colour coding using tags. Post date. The base of your social media calendar should be the date you’re posting each piece of content on. If you have a posting schedule already set up, you could just include those days of the week, otherwise input every date into this field. Post name. The post name just refers to the actual content you want to post; for instance, ‘school sports day video’ or ‘Year 12 results infographic’. Along with the date field, this will show you what’s going live and when. Status. The status field can be used to note whether a post has been created, scheduled or published, or whether work still needs to be done on it. This is ideal for workflow as it shows you what’s still left on your plate for the week! Post time. We’ve talked a bit about the best times to post to social media, but there’s really only one way to find out for sure -- test it. A post time field will let you specify which times of day you post so you can then go back and measure efficacy. Notes. Don’t forget to pop in a notes field so you can jot down thoughts about a post as you go. Depending on what your team looks like, you may want to incorporate a few other fields. If there are a few of you who collaborate on social media, you could opt for an assignee field that you can use to allocate work within your team. If you have a structured social media strategy, you could also include any elements that reflect this, such as a post type field to specify whether you publish a video, text or image post. So, now you know what should go in your content calendar. Just like all good things, the next step doesn’t come without a little effort or research. It’s time to work out what kind of social media calendar format will be most conducive to your school and marketing team. Here are a few of our recommendations. An example of a Google Sheets social media calendar. Google Sheets may seem like a basic choice, but it actually has functionalities that make for a great social media calendar. It lets you lay out all your information for easy visualisation, and its sorting and filtering capabilities mean you can organise your data by publish date or status. If your team needs visual cues, you can also tee up conditional formatting that highlights data various colours -- for instance, shading a cell red when something is incomplete or overdue. A limitation of Google Sheets is that it doesn’t take a calendar format. As a result, it can be a little hard to see what your week or month looks like at a glance. You could always try and create this within the program -- we have seen it done -- however it’ll take a lot of time and won’t be responsive, thus requiring constant updating. Plus, using tabs to separate by platform means you can’t see a top-down view of what’s going across all your social media channels at the one time. Another method often used to create a social media calendar is...well, a plain old calendar. Whether you opt for an app or digital calendar like iCal, or prefer something simple and printed, calendars are also a viable way to plan out your social media content. One benefit is that they let you see your week at a glance, so you can determine how many posts you have going live and what formats they take. 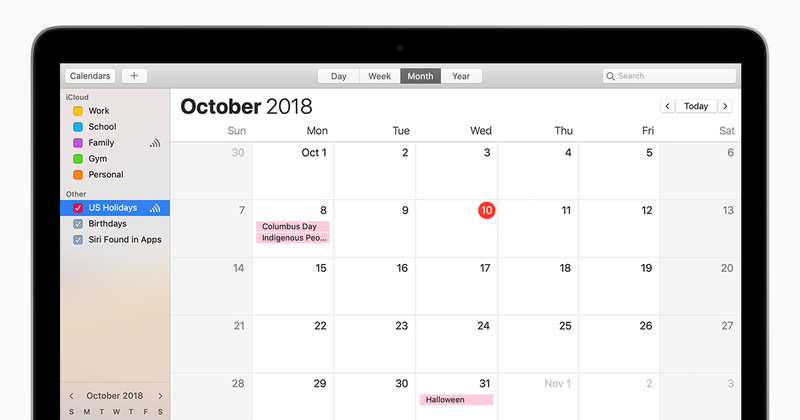 By using colour coding (such as the coloured tags available on iCal), school marketers can also see which platforms have posts going live each day, rather than having to flick between tabs. However, calendars also have their limitations. A key roadblock is that, depending on whether your calendar is digital or printed, filtering is very difficult. If you’re using a printed calendar, you’ll have no way to filter through posts. With a calendar app you can use the search bar, but similarly, this lacks functionality. 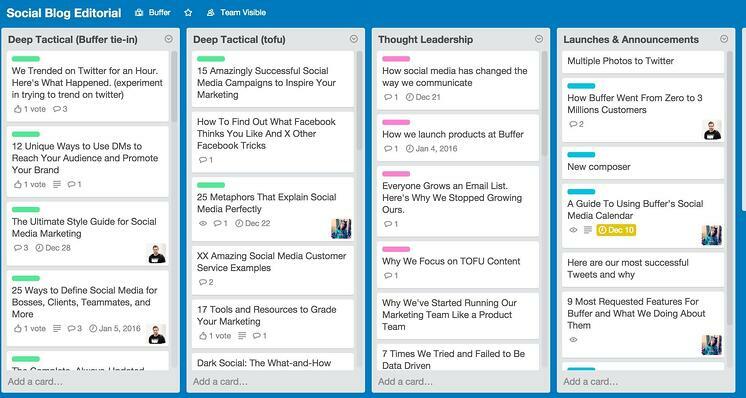 An example of a Trello social media calendar via Buffer. There are very few free softwares out there that offer the same functionality as Trello. Ideal for social media calendars and content calendars alike, Trello takes a board format and lets you assign various tasks to each one. It’s used a lot for productivity management within teams, but we’ve also seen it successfully used to mark content across various social sites. One of Trello’s big positives is that you can create multiple ‘cards’ that are all visible within the one viewframe. These must exist within a ‘board’ (e.g. your social media board, which would be designed to house all tasks related to social media). Each card then has tasks that you can check off as you complete them. All of this means that you can create cards for each social media site, then adding in your posts as tasks on the board. Another key win is Trello’s calendar view. If you assign due dates to each task, you can then see a monthly overview that lets you know what’s going live at which time. You’ll have to use colour coding to differentiate between social media sites, but the functionality is still fantastic for a free system. Trello has very few limitations, but one is the capabilities afforded by the free plan. You’ll only be able to create 10 boards, plus you won’t have access to a lot of the customisation features that the paid versions boast. 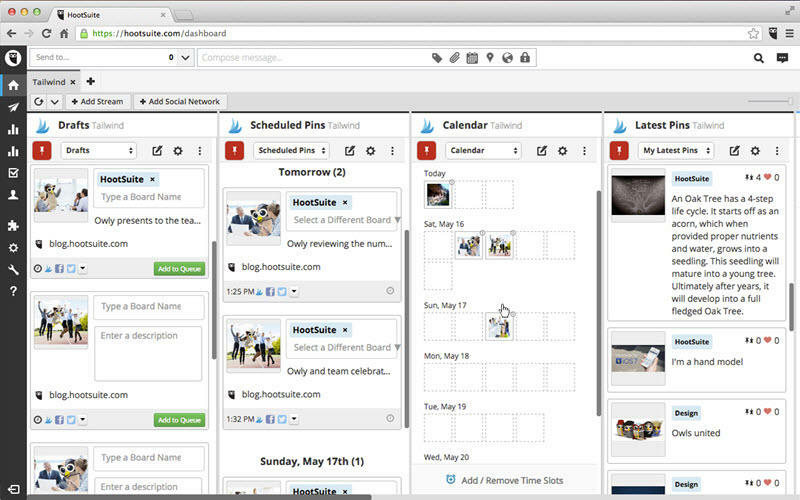 An example of a Hootsuite social media calendar via WordStream. Finally, you’ve got the option of using a dedicated software to plan and schedule your social media content. Keep in mind that this will have the best functionality, but may also carry a price tag unlike your other two options. Depending on your marketing budget and how dedicated your social media strategy is, this may or may not be possible for your school. The key advantage of using social scheduling software is the ability to automate your posts. Most paid softwares actually post to Facebook, Instagram, Twitter and LinkedIn for you, taking all of the legwork out of actually executing your social media calendar. All you need to do is tee up the post the way you want it to look, then set the scheduling date and let the program publish it for you. Another positive of most social scheduling softwares is that they give you a responsive calendar view of all your content. Not only can you see an overview of which posts are going live on which days, but the calendar will also automatically update to accommodate any changes you may make within the platform. This is great for those collaborating with others within their team, as it avoids doubling-up and miscommunication. Of course, the negative aspects include the price -- social scheduling softwares don’t come cheap, and prices get even heftier the more functionality that’s included in the program. You’ll need to devote quite a slab of your marketing budget to maintaining your subscription, so be sure that your social media use actually warrants a dedicated program. Popular social scheduling programs include Hootsuite, Buffer and Zoho Social. All of these do have free plans, but they lack the ability to schedule more than a few posts at a time. This at least means you can give ‘em a try before you commit to buying. Whatever program or tool you select, there are a ton of adaptable options out there for creating a killer social media calendar. 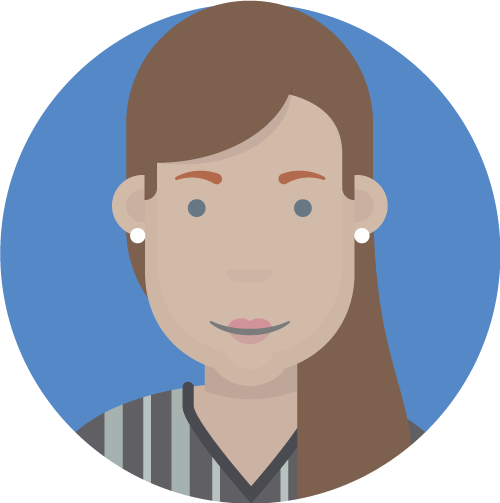 Armed with your pick of the bunch, you’ll be able to see which posts you have on the horizon in a logical, organised format that maximises efficacy within your team. Have you created a social media calendar using one of the above tools? Let us know how you went over on Twitter or Facebook!